The rabbit is the fourth symbol in the Japanese Zodiac. In ancient China, white rabbits were considered as a propitious augury. As rabbits live peacefully in groups, this symbol represents “well-being of a family”. It also represents “great progress in business” because of the way they leap forward. Rabbits are optimistic, warm, virtuous and broad-minded. While they are lovable and are regarded with admiration and trust most of the time, their trusting nature means they can be deceived easily. Cannot say no to others. Are heavy sleepers and wake up in a bad mood. Rabbits are most compatible with sheep and boars. If these three come together, it generates a great positive power. Rabbits also have a mutually beneficial relationship with dogs. Roosters are the least compatible with rabbits. 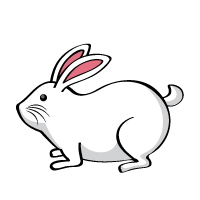 In Japanese, a rabbit is “usagi” in romaji and is written as “兎” in kanji. In the Japanese Zodiac, however, it is often called “u” and is written as “卯”.